Will High-End Appliances Increase the Value of Your Home? 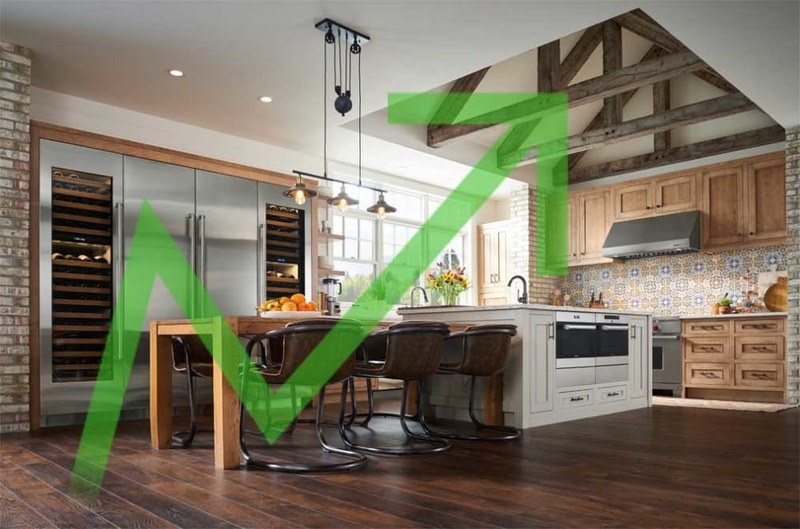 Wise homeowners always keep two questions in mind when deciding to upgrade a portion of their home—will it bring a measurable improvement to quality of life for you, and will it increase the value of your home when it comes time to sell? But not every home will see a marked increase in value due to a kitchen remodel or updated appliances. Here are some factors to keep in mind when deciding whether to splurge on new kitchen appliances. Do buyers in your real estate market expect to see high-end appliances? The real estate market in reality is not a single set of parameters and changing factors that rise and fall with time. Every region, price range and home type has its own set of rules to determine what will and will not add value. The first consideration you’ll want to bear in mind is whether buyers in your specific market expect to see high-end appliances in a home they’re considering. Buyers in the market for high-price and luxury homes, particularly those in desirable areas or in places with a reputation for luxury like Hollywood, often want to feel as though they could move in tomorrow and already have everything they need to begin living comfortably. For this reason, they will want to see luxury appliances already in place. On the other hand, upgrading your appliances may not dramatically increase the value of your home if it’s in a less high-end market or if there are other areas that could be in need of upgrade. Luxury appliances are not a must-have for many mid-range buyers, so the added appeal or return on investment when selling will not be as high. Plus, if buyers want upgraded appliances, they’ll often want to choose their own. Do comparable homes for sale in your neighborhood feature high-end appliances? As we mentioned above, decisions on whether to upgrade areas of your home for resale value are all about your unique market. One of the simplest and most important ways to get a feel for these unique traits is to take a look at other homes for sale in your neighborhood or area. These are the homes with which you’ll be competing directly, so it’s important to know the ways in which they could be out-shining your home in key areas. If you find that many of the other listed homes nearby offer high-end, brand new appliances, it may be a sign that you’ll want to upgrade your own in order to make an impact with potential buyers and upgrade the value of your home. The critical point to remember is that all of these decisions boil down to your own individual market. There’s no one catch-all answer that will guide you—it must be a decision based on the unique factors that define your area, price range, home type and targeted buyers. Do you enjoy cooking and entertaining on a personal level? So far, the factors we’ve discussed have all related directly to the monetary value of your home. But there is another kind of value to be considered, and that’s the value that updated appliances can bring to your everyday life. Always remember that your home is meant to be lived in, so investments that will add to your quality of life should usually be considered worthwhile. If you want to enjoy high-end luxury but don’t want to update every appliance in your home, we recommend splurging on an all-in-one, pro-style kitchen range. It’s the most effective way to brilliantly update your kitchen with a single item, and tends to be the appliance that frequent chefs and entertaining homeowners use the most. If you love entertaining and cooking in your kitchen on a regular basis, high-end appliances will bring you satisfaction and convenience on a regular basis. That’s real value that can’t be ignored, and you should be sure to factor it into any consideration of whether luxury appliances are a worthwhile investment in your home. After all, it is your home until the moment it’s sold. While it would be nice if there were a be-all-end-all answer to determine whether you should upgrade your appliances, it really comes down to your home market, region, price range, and personal tastes and preferences. One final tip to consider is that it’s possible to get a high-end look without dropping several thousands of dollars on the highest end brand names. There are plenty of affordable brands offering luxury looks and dependable features without breaking the bank. If you’re on the fence about upgrading for the sake of resale value, this route might be an effective compromise. It might be just what you need to get your home cooking on the market.